If you are into my sappy side, you can read some of my thoughts on Ada turning one. Yes. I'm in hyper-reflection mode this week. Fittingly, I have been thinking quite a bit about my running over the past year. Along with all the milestones and major events related to my role as "mommy" -- one of my proudest accomplishments is continuing my running through the good times and bad. 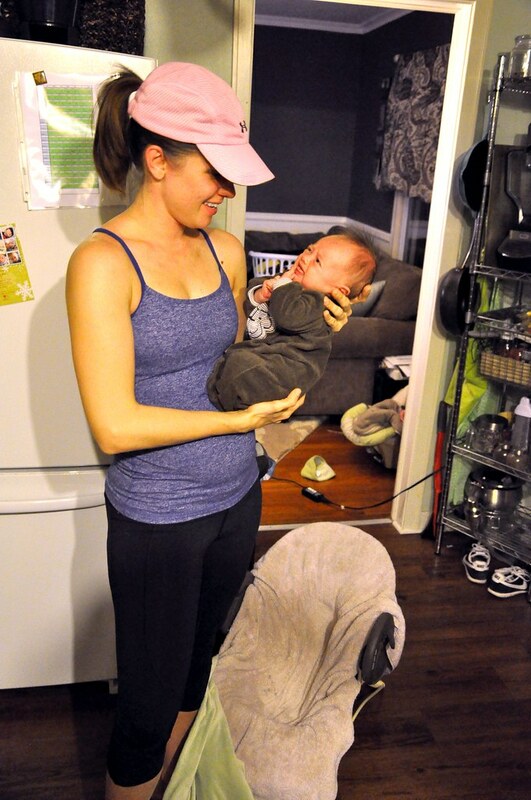 At first, I wasn't sure how it would go -- juggling everything with a newborn, that is. Sure, there have been several interests and activities I've had to put on the back burner (learning to sew, anyone?). The fact is: Ada's turning one, but I've nurtured my internal running buddy for over 10 years. When I think of it that way, it becomes clear to me why I couldn't let that particular relationship slip. Running is a huge part of me. My identity as a mother is the most important -- chief of all. However, without attention to the other things that make me who I am, I'd be lost. Running at 5 weeks . . .
. . . and 52 weeks! Here are 5 reasons I love being a mommy runner! #1: My mental health. I've had a rocky year. I'm sure many first-time parents can likely relate. Sometimes the only way I could get peace of mind was to head out and put one foot in front of the other. I'm the type of person who gets paralyzed when I'm stressed out, so making myself get outside, breathe fresh air, and move my body helps more than anything else. #2: Obviously my physical health benefits from continued running. My body didn't respond to breastfeeding by losing weight. Actually, I think I held onto a good five pounds. I was just reading an article in Shape that declared one of the best ways to lose weight after baby is breastfeeding. I laughed out loud. And then cried a bit -- just kidding. This magic weight loss "rule" is NOT true for everyone, even when you live a healthy and active lifestyle. #3: I get time -- ME-time. I know I've complained about not getting enough time to indulge my interests. In reality, that's a rare luxury that not many moms (or PEOPLE, for that matter) can enjoy. When all else fails, I know I have at least half an hour each day when I can get out of the house by myself. If it's a particularly bad day, maybe that half hour is only 20 minutes. Whatever. But at least if I run, I know I get to take a shower too. #4: I already mentioned it above: Running is a huge part of my identity. It's one of the first things I decided to do for myself as an adult. As you all know, I left my desk job this year to work at home and stay home with Ada. Sometimes it's isolating and confusing changing roles so drastically. But just as I was always much more than a marketing coordinator or administrative assistant in my "old" life, so too am I more than just a mom and writer. I also intended to share some tips on how I've fit running into my life. How Stephen and I both do, really. The way it works now isn't the way it used to when I had unlimited time and far less obligations. The post got way too long, so I'm saving that information for later in the week. If you have any questions, I'd be happy to answer them, just leave a comment or email us at neverhomemaker [at] gmail [dot] com. And if you're a mom (or dad) runner, what is the #1 reason you keep at it?